Auburn Industrial products are the industry standard for combustion equipment globally. For over 100 years, Auburn has been the leading brand in igniter's and combustion sensors throughout the world. The Auburn product line consists of igniter's and flame sensors used as ignition sources and flame detection in burner operation. 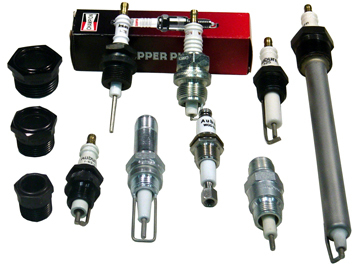 Liquid level sensors are used in control systems that rely on the electrical conductivity of fluids. Feed-through is used to transmit current into a sealed vessel, and sight glass allow operators to confirm ignition and flame propagation.